It begins, as it always does, with the trip to the spa. Your mind plays tricks, insistently fetching the frets of the day ("Did I remember to make that call? Do I need more gas? "), haunting you until you actually get near the spa. In a perfect world, just the sight of the spa wipes all of those worries away. The maxim, "it's more about the journey than the destination," doesn't always cut it when you're hurriedly on your way to a refuge. Get the traffic get out of my way. Move! I want my treatment. I need to relax. The journey to Temple Mountain Spa at Lake Louise is one of those memorable drives that fulfill the promise of forthcoming bliss. It's a Shangri-la like road through Banff National Park that leads past pretty blue-green streams and towering Canadian Rocky Mountains to the village of Lake Louise. If you were to drive from the mountain town of Banff, where you can sample Rocky Mountain Cuisine at many fine dining restaurants, it's about 45 minutes. And there, at the not too distant turn across a small bridge, is the striking red roof of the luxurious Post Hotel. Snuggled in the sea of mountains, sheltered by trees where a vigorous river runs, the hotel that has won numerous prestigious international awards (including Condé Nast Traveler's Gold List) harbours deep within itself a remarkably intimate and rejuvenating spa. You descend into the spa down a short set of stairs. The Temple Mountain Spa's sitting room is bathed in pools of soft light. When you recline in one of the caramel leather chairs, there is a lit fireplace and a gentle waterfall. Besides the muffled sounds of white-jacketed staff coming and going, there is likely nothing to distract you, aside from the shuffling of ice in your glass of fresh lime water as you raise it to your lips. "Our guests are usually very well traveled, and we are small enough that we can take the time to make sure they relax," says Anne Witzaney, the spa's director. "The spa is well integrated with the hotel, which is all about service. Here, there is no rush." Indeed. You are in the middle of mountains and forest at the hotel and spa, and that ambience is retained even in the refuge of the change room, where music that's stored on the hotel's hard drive shuffles chirping birds, acoustic guitar, classical strings, Enya and even the whoosh of wind in the trees. The men's change room has a muted green tile with blue accents and vibrant wood. That's not something I'd normally notice, but in a spa, I've learned the attention to details is everything. Details tend to accumulate as soon as you step onto the property and they result in the finished experience. At Temple Mountain Spa, I stepped into sandals, brown, that massaged my soles with each stride. The robe I wore after shedding my clothes (and symbolically, my worries) was distinctive: it's made with a micro-fibre so that it doesn't hold too much heat, it comes in white and green, and it's remarkably comfortable. There is a stream room, a whirlpool with strong jets, other amenities, and I luxuriously had the room to myself. 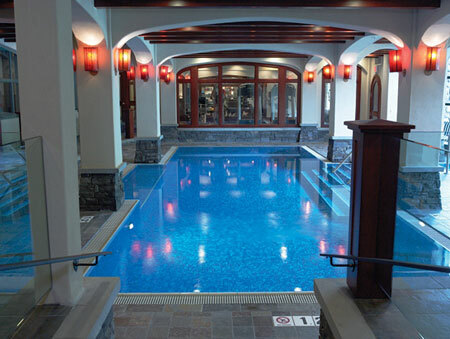 While Temple Mountain Spa has various rooms that accommodate couples and even families, it is not unusual, says Witzaney, for you to have the change area and its myriad of pleasures to yourself. If you are going to be in the Canadian Rocky Mountains, you might as well enjoy a spa experience that is particularly Canadian. Purely Canadian products are used in this refreshing, anti-aging, and balancing 75-minute body treatment. This is one of many treatments available. To find prices and the variety of services, I encourage you to visit the spa website. It begins with a Glacial Purifying Body Cleanser, followed by a Green Tea and Pacific Seawood Salt Glow. This is the nitty gritty of the treatment, as it prepares your skin for purification and detoxification. The salt glow product was exceptionally fine, almost like crushed, soft sand you can find on certain beaches. Pacific seaweed from the Canadian Pacific Ocean offers numerous benefits to the skin, including vital micronutrients that have the power to renew and revitalize the skin when applied topically. The seaweed is composed of rich micro-nutrients, including zinc, potassium, magnesium, iron and others. The Glacial Clay contains rich earth elements, vitamins and micro-nutrients. And the colloidal clay is so super fine, it contains particles fine enough to penetrate deep into the inner layer of the skin, according to Ancient Secrets Inc. founder Sherina Jamal. I don't have the expertise to evaluate what exactly this combination was doing to my body, but I can attest that it's a totally relaxing experience. For me, the highlight of the treatment was being wrapped almost mummy-like with a moisturizing gel on my body and a firming mud mask on my face, while a deep scalp massage made me deliciously drowsy. You can choose the Skin Quenching Hydr-Osy Body Mask or the Pacific Seaweed Mineral Firming Mask. And while you enjoy for body mask, you can receive a Glacial Facial. The treatment is completed with Glacier Water and Vita-C Mist and a Seaweed Body Butter to restore your entire body. In between applications of product, I had warm showers to cleanse each layer and to prepare for the next. It's like going through a series of skin resurrections: you are shedding and then replenishing. It serves to break up the overall treatment into mini-treatments, each with its own particular characteristics. Everyone has their preferences and you do have the opportunity with this treatment to discover your own. Other signature treatments include the Temple Mountain Escape (135 minutes of body polish, cocooning in Rose Clay from the Provence region of France, scalp massage, exotic Herbal Thai Stem Massage and more). There is also the Alpine Aroma Detox Treatment. The essence of each is inner calm: the cultivation of it within you, as you relax within the breathe-in, breathe-out ethos of the property. Another way to travel to the Post Hotel and Temple Mountain Spa is to come from the authentic, laid-back mountain town of Jasper in another of Alberta's national parks. You can drive the magnificent Icefields Parkway, which is one of the most scenic driving stretches in the world, featuring glaciers and, of course, icefields. It links the national parks of Jasper and Banff. The distance from Jasper to Lake Louise is 237 km (148 mi). 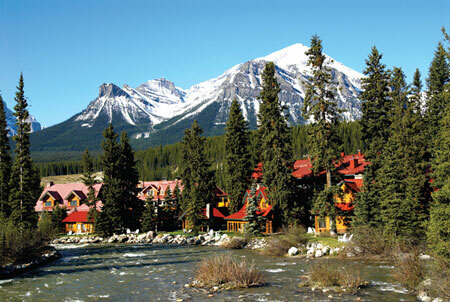 Travel Alberta is the destination marketing organization for the Province of Alberta. Guided by the Strategic Tourism Marketing Council, Travel Alberta is the steward for the effective delivery of tourism marketing programs. For information about our organization, please visit our Travel Alberta industry web site.